…comes from some other beginning’s end. The smallest of our smalls had a new beginning this week. 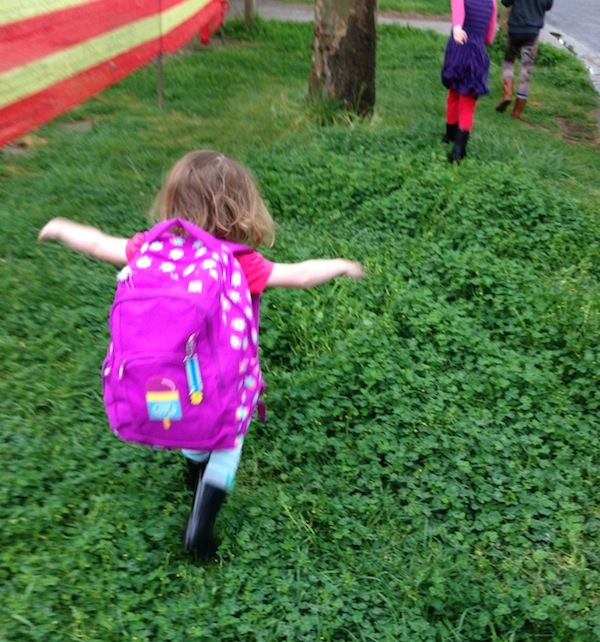 She’s ready, off and racing to pre-school two days a week. For me, it was the end of full-time parenting. After more than 8 years of having one, two or all three at home with me everyday, I have to admit I’m feeling a little lost. The past two days have been rather unproductive and I’ve taken to eating cake for lunch and comfort. Good cake with lots of fibre but still, cake. There are some days when cake and tea are a perfectly suitable lunch. It’s also a new beginning. I have two full days in which to design and make quilts, write patterns and work for my consultancy clients. Two full days each week working from home (as well as all of the nights after the smalls are in bed). This entry was posted in change, family, parenting on October 14, 2014 by procrasticraft. Hello! I just found your blog – it’s lovely! I am in Qld and I work from home. 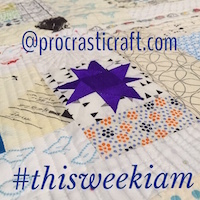 Great to discover another Aussie quilter! I loved mdlonnie’s comment – all of my kids are now in their 20’s and there are plenty of stages when you can really feel that you’ve reached another level in your life – ready or not! I use the lure of my quilting to help me get my official work done. I don’t let myself go to sew unless I’ve finished some emails/reports/onerous task etc. Of course it doesn’t really stop me reading blogs…. ahem…. hence my random greetings today… and the enjoyment of “faffing”. I have become quite socially isolated because of working from home – so I love to keep in touch with the lovely on line quilting community. No matter where we are from – we have a lot in common as mothers and quilters. When I worked from home, I used to schedule my day. I used the weekly schedule pad from Kikki k. I’d even include an hour for lunch which included a potter around the garden. Everything was on there. Made for a very productive day/week. Good luck! Also, I haven’t been able to reply on the blog but thanks for the pattern info. Anytime! It’s a great pattern because there are 5 seams in total that you can take in or out to give a great fit. Also I ignore the zipper – doesn’t need it. awww, bless her with that giant backpack! I work from home, and I spend an enormous amount of time faffing. Having a dog helps a little, though, because it (oddly) adds some structure to the day. I know that I get back from walking by 11.30, so there is time for a cuppa and I start work at 12 (theoretically). I like a good list. Ticking things off (no matter how small) seems to motivate me. You are on every mothers journey, next week WILL be better, and your creative edge will return with a gusto! Deadlines. Even if they are ones you deg yourself, you gotta have them! You are SO right! I really don’t get anything done without them.